Cognizant, a NASDAQ-listed, US-headquartered provider of information technology, is expanding its operations in Kerala by leasing 15 acres of land at the Kochi Infopark campus. The company Tuesday signed a Memorandum of Understanding (MoU) with the Kerala government for this. When fully completed, Cognizant's new campus in Infopark Phase II will have a built-up area of 1.6 million sq ft and the capacity to accommodate around 12,000 professionals. We are providing our Clients with luxury villas in Kakkanad Cognizant will develop the campus in phases. The first phase is being built at a cost of approximately $50 million and will consist of a 550,000 sq. ft. software development block with a capacity to accommodate over 4,000 professionals. 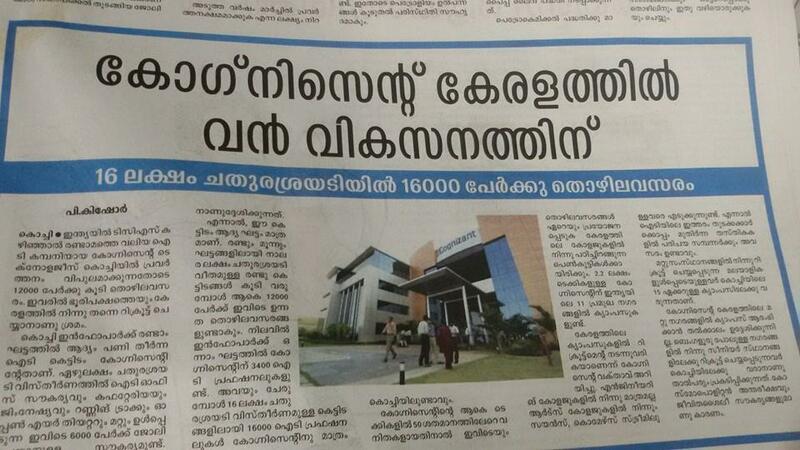 Currently, Cognizant has over 1,500 professionals working from the first phase of Kochi Infopark. “We are committed to growing our operations in Kochi and tapping into the world-class talent in the state of Kerala,” said R. Chandrasekaran, President and Managing Director, Global Delivery, Cognizant.